Every photographer knows that post processing is as important as taking photos. It started from film age and still continues in digital age. I am no different, I do post processing of photos I shot using my DSLR. One thing I am always clear is, I will never alter the composition by adding extra object that’s not part of the initial photo. In my post processing I deal with saturation and blackness, also based on the photo I will apply prebuilt effects like grayscale, vintage, lomography, etc. One of the biggest advantage of mobile photography is I don’t want to wait till I get back home for doing my processing. I can photograph it and instantly do my processing and can share it with my friends within no time. 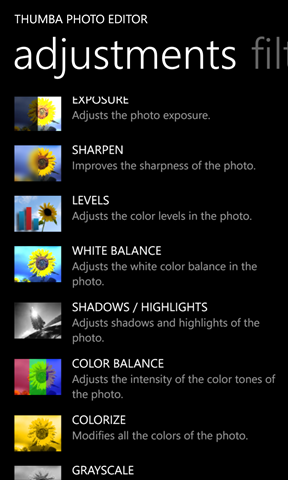 One of the challenge in editing is finding the right tool, in this post I will explain some of the photo editors I use to do the post processing in my Lumia 920. All the editor I mentioned below will overwrite the EXIF info of the photo. I think EXIF is really required and the editors should not overwrite it. Thumba Photo Editor is a paid app, a trial version is also available to experiment the functionalities of the app, but we can’t save the photos. I feel it’s worth for the money If you are serious about post processing, so I bought this app. In Thumba editor, editing functionalities are categorized into Image, Adjustments, Filters and Effects. All the functionality in each category have an inline description as well. 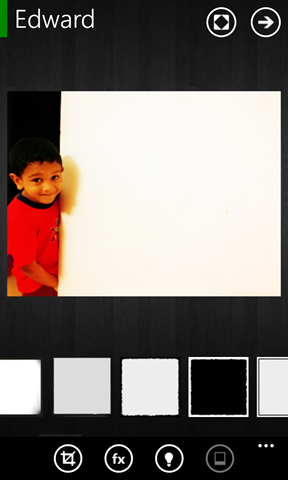 In the Image tab you can see options to Crop, Resize, Red eye removal, adding border etc. In adjustments tab we can find options to adjust Exposure, Saturation, White balance, etc. 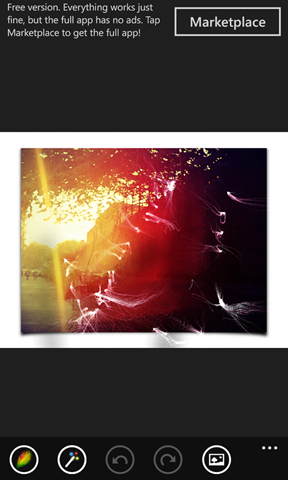 In Filters tab we can see a list of prebuilt effects like Vintage, Vignette, Lomography, etc. In the Effects tab we can see options for converting image to Oil paint, Night vision, Mosaic, etc, I don’t really use this tab. One feature I badly need is applying different types of Borders. In Thumba we can apply a plain border in different colors. For applying different borders I use Lomogram. As part of initial setup we need to change the picture quality settings, other wise Thumba will compress the image and will loose the quality. To change the setting go to Settings->Photo and choose desired JEPG quality. I set it to 100. 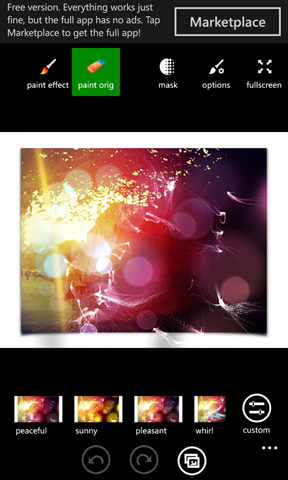 Fantasia Painter has a free and paid version. In free version you will get all the features but with Advertisements. Fantasia also provides a lot of features like what I get in Thumba. One of the great feature of Fantasia is it’s Brush. Using Brush functionality you can do Smudging, Lighten or Darken the photos by brushing on top of the image, Erasing the brush strokes and a lot. This painting feature is not available in Thumba editor. Another great feature of Fantasia is you can choose different supported effects and add or reduce that effect by customizing it. I love this customization feature as well. As part of initial setup we need to change the JPEG quality, other wise Fantasia will compress the image and will lose the quality. To change the JPEG quality, go to settings and choose the desired quality. To get the settings screen, click on Open/Save button and on the top bar you can see the settings button. 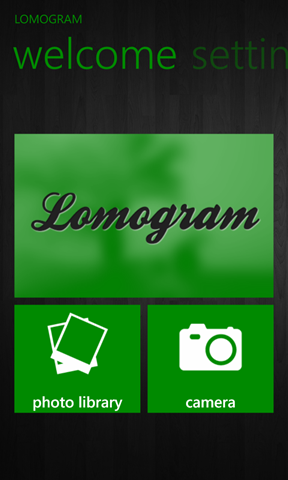 Lomogram is a light weight editing app with filters similar to Instagram. It’s pretty simple to use and free. 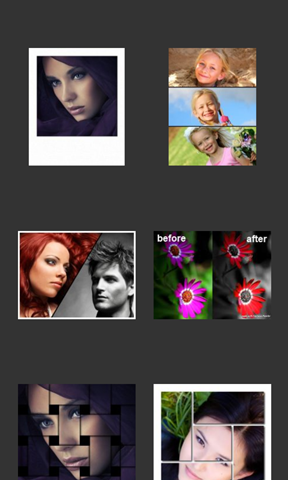 We can apply Filters, Lighting effects and Border as well as Crop photo. It has 42 filter, 72 Lighting effects, 49 borders (I didn’t count, copied it from app store). I love this tool because of it’s vast collection of Borders. If you want high quality image, change the Ouput quality to high in settings tab, by default it set to medium. One issue with Lomogram is, it reduces the picture size. I sent a mail to the developers of Lomogram detailing this problem and below is the reply I got from them. Thanks for your feedback! 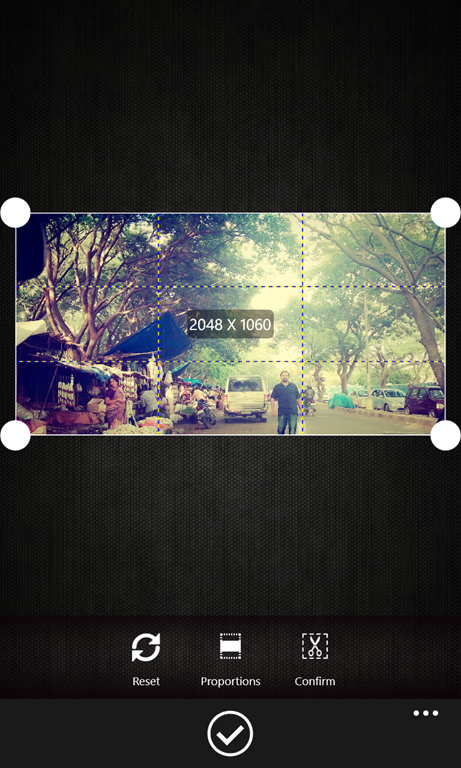 Unfortunately, there are two reasons why Lomogram reduces the image size. 1) Current Version has an issue. Maximum image dimensions should be 1200×1200 but they are 1024×768. 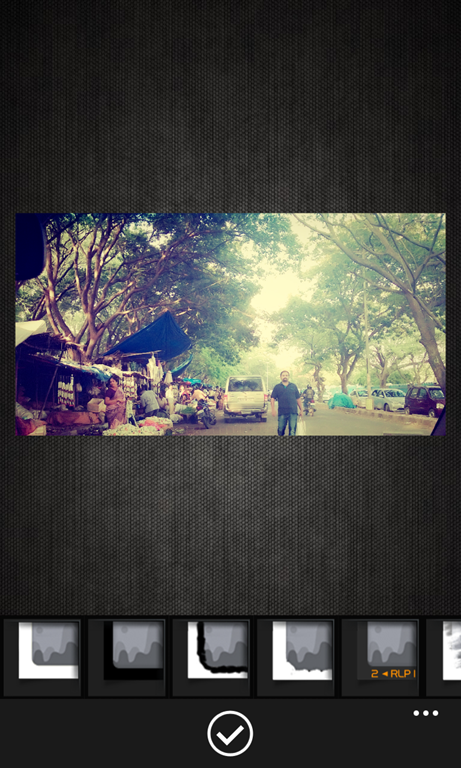 So if you need a high quality image better stay away from Lomogram until an update that fix the image size issue. 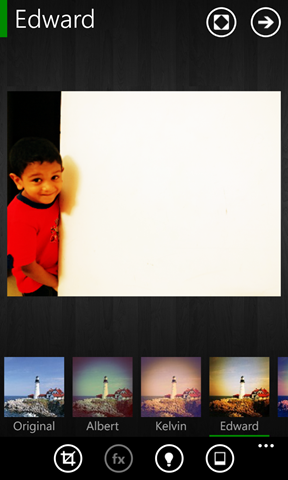 Fotor is a simple but elegant photo editing apps like Lomogram. 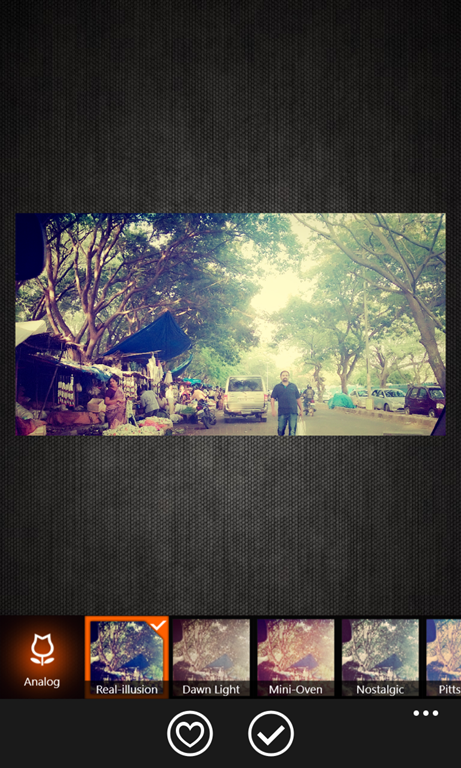 It has features just like Lomogram like Cropping, Filters. One extra feature in Fotor that doesn’t exist in other apps is Tilt-Shift. With Tilt-Shift you can give focus to a specific area rest and will be blured. Both Fantasia and Thumba has great photo editing capabilities. Before you invest in the app try it out first and see whether it meets your expectation. I used Lomogram for applying Borders. Taking photos comes first then editing, so invest in a good camera app, see my other post about my favorite Camera apps. I never enjoyed mobile photography before but now I really enjoying after I bought my Lumia 920. It’s a perfect mobile camera with low light imaging capability. 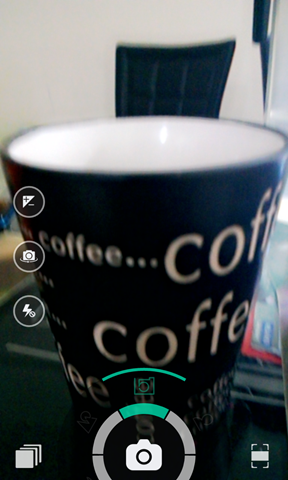 Initially I started experimenting with the default Lens app provided with the WP8. 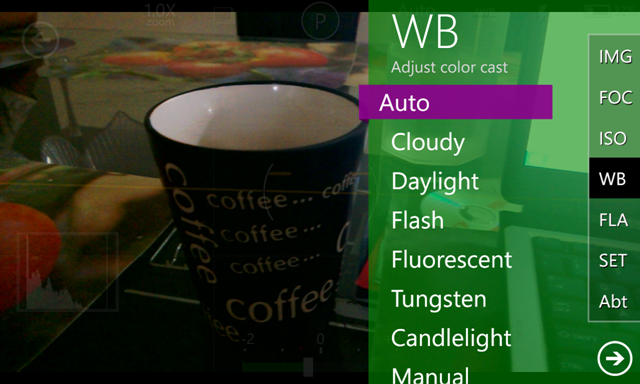 But controlling different parameters like Whitebalance, Exposure compensation, Exposure, etc was a bit difficult. So I started searching for better camera apps and I tried different camera apps. In this post I will explain two camera apps that I fell in love with and used it in my day today life, ProShot and Camera 360. I stumble upon ProShot two weeks ago. First I tried the trial version and bought the paid version the same day. 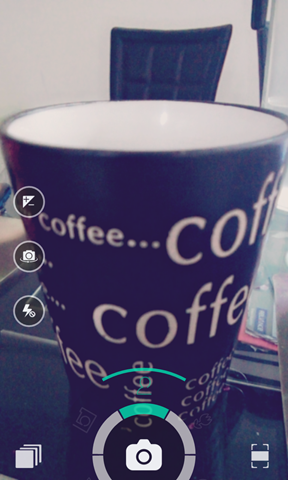 It’s a wonderful camera app with good control on your camera settings. 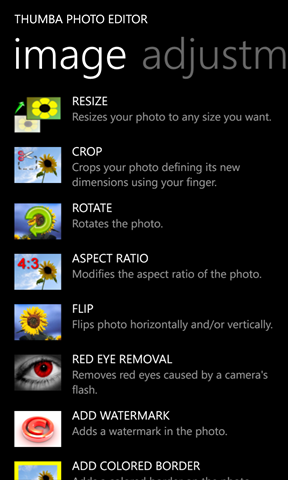 Lumia 920 has a 26mm lens with f/2.0 fixed aperture so we can take shot only in Aperture priority mode, so you can only control Shutter not the aperture. That means I wanted the ability to control the shutter speed, exposure compensation, etc. 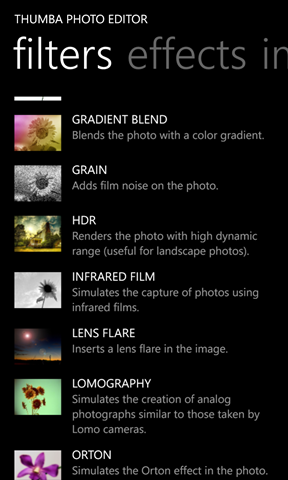 With Proshot I can easily control all these required settings and the settings are easily available from the screen itself. I don’t need to go into any settings screen to change it. In ProShot mainly three modes available Auto, Programmed and Manual. Most of the time I use Programmed or Manual mode. 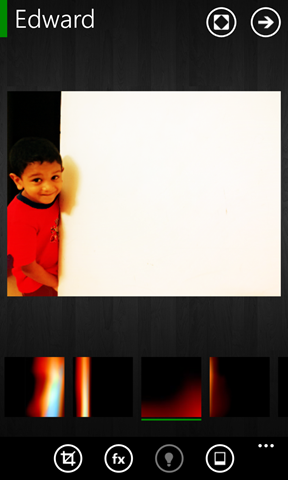 I use Program mode to shot my naughty son 🙂 as I don’t get time to adjust the exposure when he runs around. So I let the camera to decide the exposure. I think apart from Exposure all other settings available in Programmed mode. In Manual mode I have full control of exposure and all other settings. One feature I am missing in mobile photography is light metering. I am not sure whether it’s possible. It will be a big gain if I get it, so I can easily decide what exposure I should set. Other wise I have to experiment with different exposure for a scene and choose a perfect one. So it’s a trial and error method. Note: If any one has better way of choosing exposure in manual mode, please update it in the comment section. By default Grid lines are turned off. We have several uses of grid lines. One I felt is help to apply rule of third. You can find more use with it. I am not going into the details of other settings and features. If you own a DSLR probably you might have used those settings and very well aware of it. 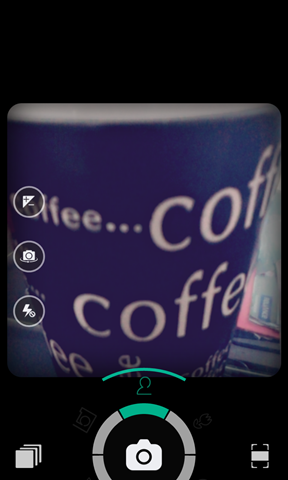 Camera360 is a very simple to use camera app, with great user interface. With Camera360 I cannot control exposure or other advanced settings but it has several prebuilt Programmed modes like Macro, scenery, Portrait, Night and Auto. All the different modes can be selected just by rotating the selection wheel. Also I can apply different effects by swiping the screen and I can see the effects in real time. With this real time preview of effects I don’t need to visualize it, I can see it in action. 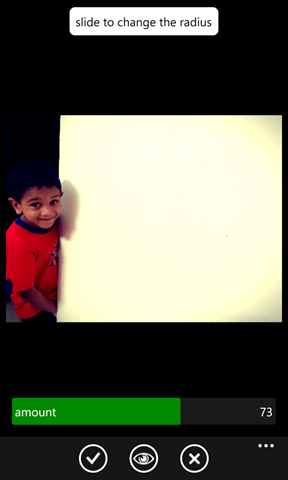 Camera 360 comes with photo editing capabilities. In editing mode you can try applying different effects to the photo and decide which one to apply. That gives us more freedom while shooting, shot using any of the available programmed mode with any or default effect, later using edit mode change the effects. So no need to worry about effects and I wont miss my precious moments. App also have a Photo calendar where I can see the photos in date wise. 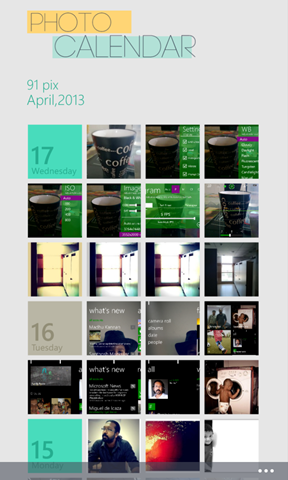 I would say the Photo Calendar UI is great. In my opinion with these two cameras apps I can take great photos. 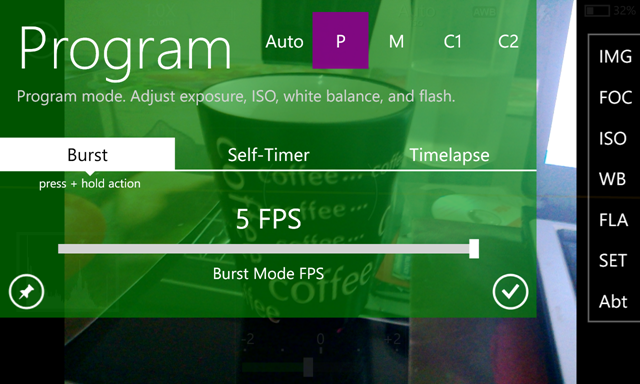 Also Windows phone store has some great apps specifically for photo editing. With these camera apps and Photo editors my mobile can be used as a camera and a post production machine. I don’t need to get back to my laptop for post processing. I shot it, process it, share it. In my next post I will tell my favorite Photo editor apps. Mean while have a look at some my photos taken using my Lumia 920. 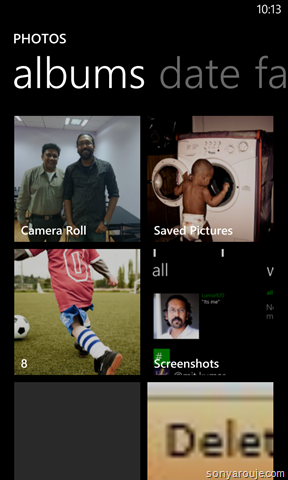 Happy clicking and let me know your favorite camera apps for Windows Phone 8. I moved to Lumia 920 a month ago from iPhone. I felt like I did a good decision of choosing Windows Phone 8, especially Lumia 920. Nokia Lumia 920 is an awesome phone with superior built quality. 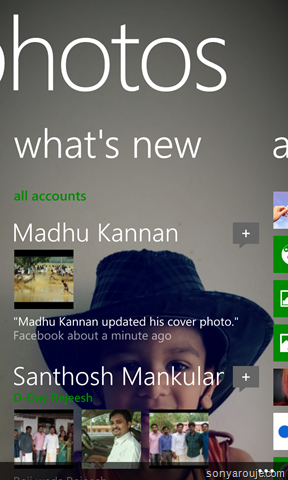 WP8 got a fresh new look with live tiles. I got really bored with the icon interface I deal every day in my iPhone or Android tab. 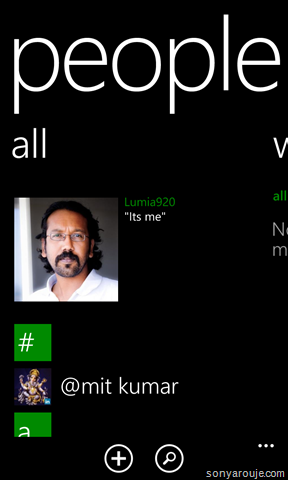 In this post I will go through the features I feel very important to me in Lumia 920 WP8 Phone. 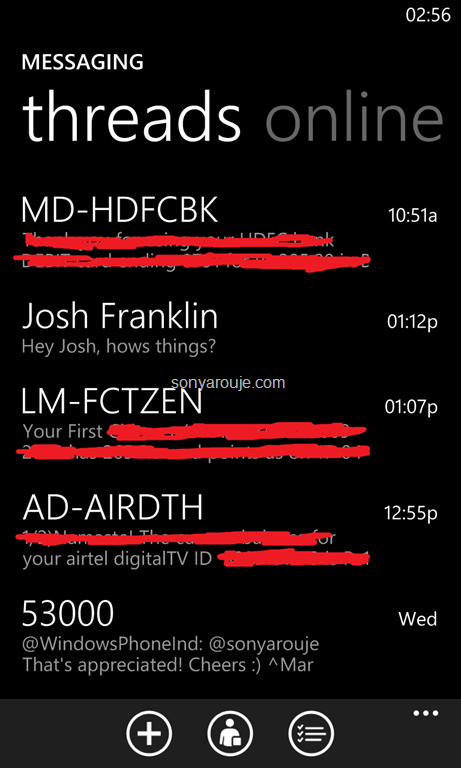 People hub in Windows Phone is not just an address book, it’s integrated with Facebook, LinkedIn, Twitter, etc. I can see my friends Twitter or Facebook updates just looking at the ‘What’s new’ tab. Some times I might lost in the updates from so many friends and miss updates from my close friends or family members. To overcome that I can categorize my contacts as groups and see the updates only from the contacts belongs to that group. For e.g. I have a family group where all my family members added to it, that way I don’t miss any update from my wife or little sister or bro. 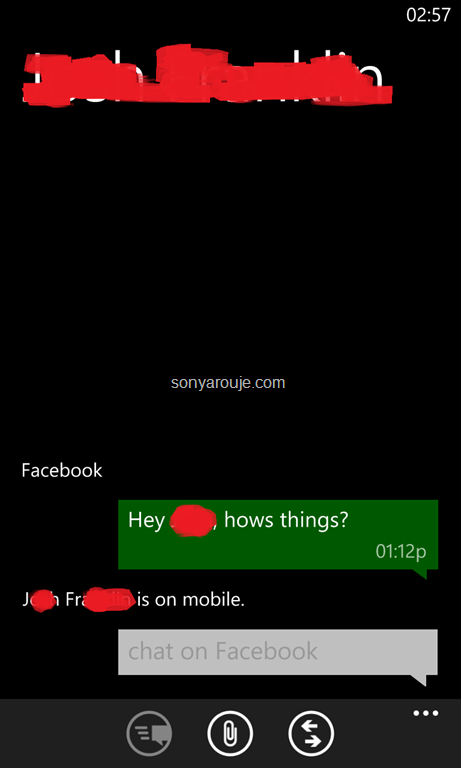 Another important feature is I can write to the Facebook wall of my contact directly from the People hub, I don’t need any Facebook client. Just select the contact and tap Write on wall and enter what ever I need to post. Same way I can tweet to my contact from People hub. Photos hub is the place I can see all the photos taken using my phone, as well as the photos I uploaded to Facebook albums and sky drive. It’s a great feature for me, I can easily identify which are the photos I need to upload to Facebook. Another feature I like is syncing the photos I uploaded to Facebook from my tab or laptop with my phone. Just go to the Photos hub and open the Facebook album then open the photo I wanted offline, from the menu select ‘save to phone’, done, I can see the photo in Saved picture album/folder. 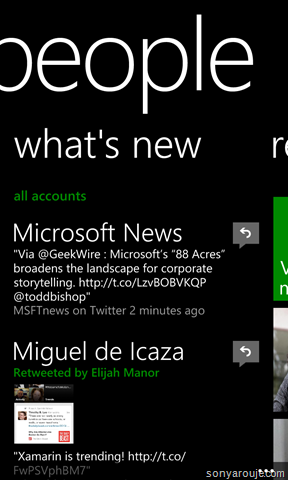 I can also see the latest Photos from my friends by just going to ‘what’s new’ tab. I don’t need any third party apps, it’s all built in. I really care for my photos and wanted to backup regularly. With built in Skydrive integration I can directly upload it to Skydrive, no need to wait till I get back home to sync with my Laptop. Also I feel more secured syncing to skydrive, because my laptop can crash any time but skydrive won’t. The Music + Videos Hub is where I can play and manage my music. 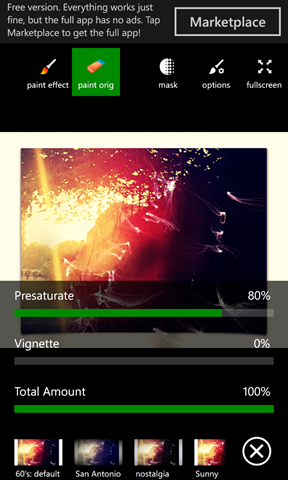 I use Winows Phone app to sync my music. 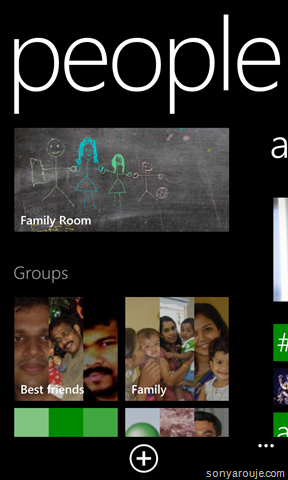 The biggest advantage of Windows Phone app is, it can sync playlist from iTunes or Media player list. I prefer iTunes sync as I organized my music library in iTunes and I cant afford reorganizing it again. One of the feature I like in Winows phone 8 Email client is, the consistency in the user interface. I configured my two gmail accounts, my MS account and my office exchange email. All the mail client behave the same consistent manner and I really like that consistency. I have an Android tab and it has two email clients one from google and another one for exchange mails. Both has different type of interface and need different type of user interaction, It’s a pain. Another feature I feel very important is linking inbox, means I can link different email accounts and show it in single inbox. I like that Calendar tile pinned to my home even though the Calendar app’s look and feel is not that great. But it does it’s job very well. My calendar is synced with my office exchange mail, facebook events and birthdays, gmail events, etc. It’s really help me to keep track of my schedules. Most importantly I don’t miss any of my friends birthdays 🙂 as it synced with Facebook birthdays. My passionate hobby is Photography and I own a DLSR. But carrying my camera every where is difficult and my Lumia 920 solves it. Lumia 920 has an awesome camera and is capable of taking low light shots. In DSLR 99% of the time I shot without flash and Lumia 920’s low light imaging capability helps me to shot without flash. 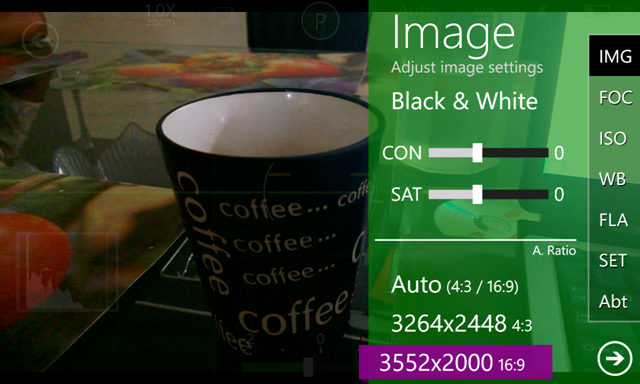 You can find a great review of Lumia 920 Camera in wpcentral. 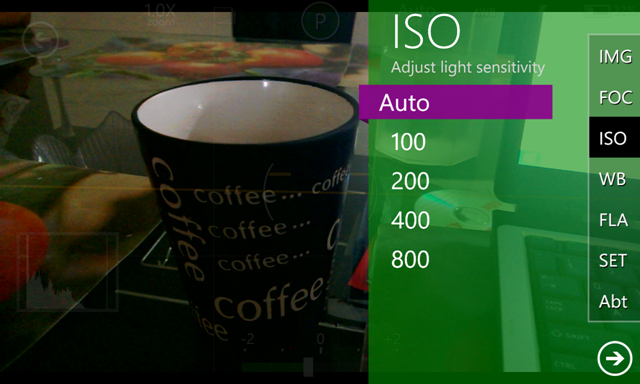 I also have a great control on other setting like Whitebalance, exposure compensation, focusing, etc. I feel like I got every control I need for a better shot except the light metering :). To get full control of your camera you need to buy app like Proshot, it’s topic for another post. 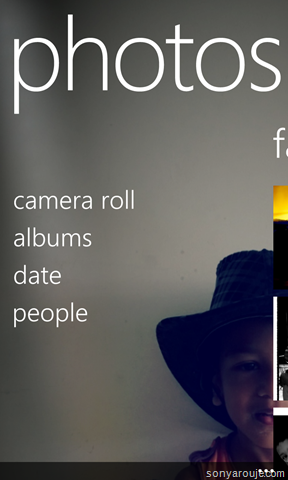 You can find the photos taken using Lumia920 in my flickr set, don’t forget to leave your comments :). Some of the photos I shot using Lumia 920. I could find all the apps I regularly use in my iPhone or android. Check it out yourself. 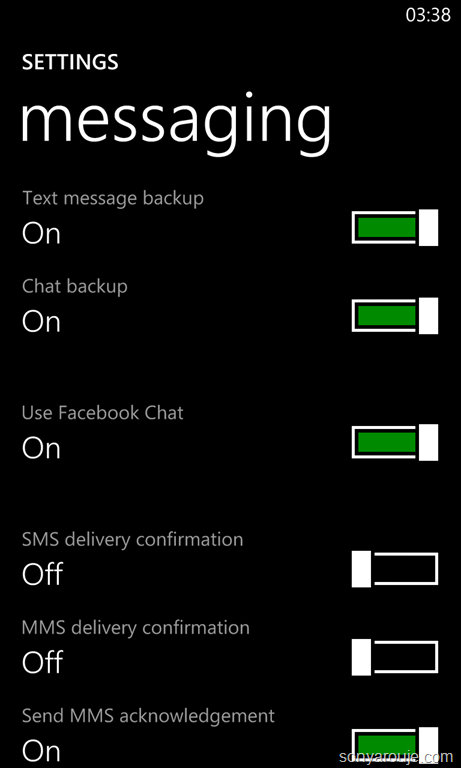 Dialer: I wonder why WP8 is not equipped with a dialer like Rapdialer (not expecting all features). I like the idea of pinning contacts or groups to home but I really don’t want to clutter my home screen with so many tiles. 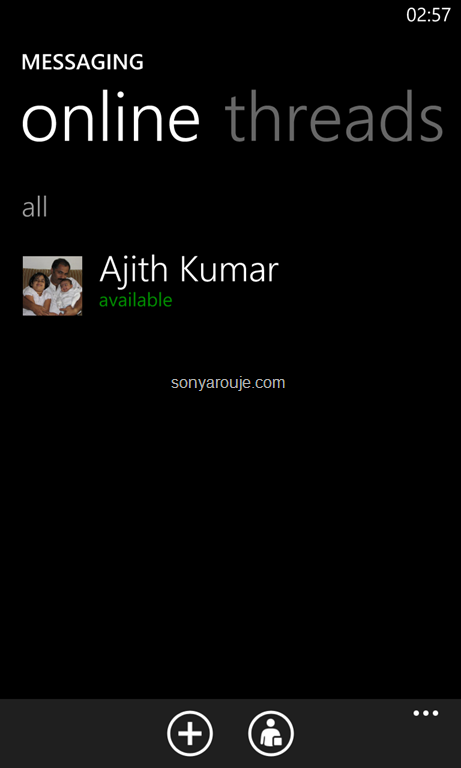 To ease my calling experience I bought RapDialer app. What I really wanted is a favorite contacts and should be able to access it from the default dialer, like the one available in iPhone. Close Apps from Task switching window: I can see all the apps opened by doing a long press of the Back button. But it will be good if I can able to close it manually from the task switching window. I am not sure whether it’s achievable.